Irish music, Irish dancing, Irish Coffee, and in fact the whole country, are some of my favorite things. But David says I’m just an old fart, because I don’t get the attraction of celebrating a holiday that mostly celebrates a good excuse for getting drunk. Is it that my age is showing? Or is it because I am just not any fun anymore? “OH PLEEEEZE”. It’s because where we live in NYC there are lots of Irish bars (Eamon’s, Dubliner) and by early evening there are a great many under- and over- aged people likely to be screaming obscenities, not singing celebratory Irish melodies, but throwing beer bottles and vomiting on our front steps, It’s just not my favorite day in the City. The President went to an Irish bar on the Hill, and had himself a Guinness with the boys. Of course he did. When you are a politician and it is a political season, you either march in a St Paddy’s Day parade, or you go to an Irish bar a drink a beer –preferably green. 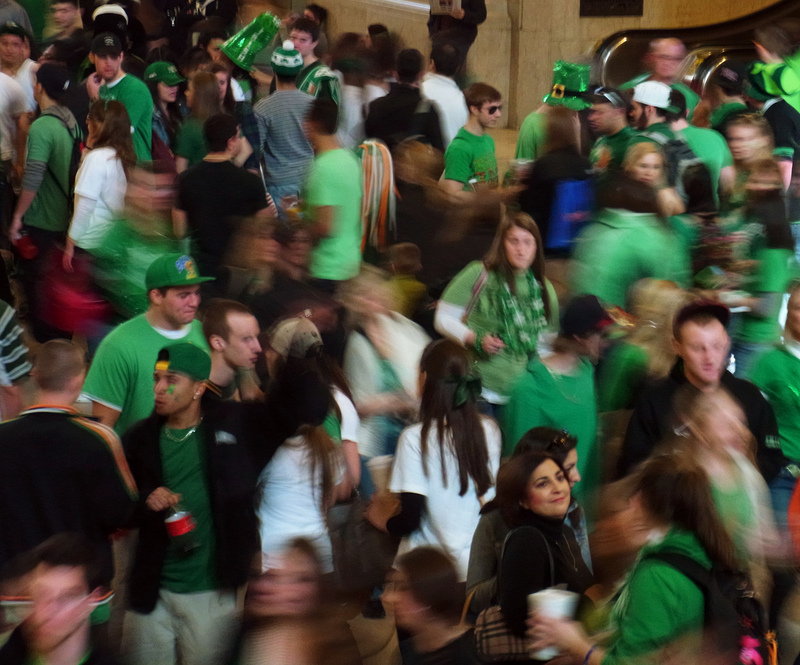 We thought we might have a glimpse of the St. Pat’s Day parade in NYC. What a terrible mistake. There we were walking East to West. We though it might be a good day to get half price theater TKTS – since all the tourists were watching the parade – or being in it. I’m not sure anyone but the marchers were watching the parade. The police had Madison Avenue, and 6th Avenue sealed. There was no way to even gain access to the parade. David even had on his press credentials and they did not care. No one was getting from Mad or 6th across 5th, at least not in the 30’s, 40’s or 50’s. Of course we all know what a terrible threat those drunk Irish teenagers can be, so it made absolutely great sense not to allow anyone in the entire city to see the earnest marchers strut their stuff. “OH PLEEEZE”! Does anyone actually know why this holiday is celebrated? Well, I found out. Patrick was born in Roman Britain in the fourth century, into a wealthy Romano-British family. His father was a deacon and his grandfather was a priest in the Christian church. At the age of sixteen, he was kidnapped by Irish raiders and taken captive to Ireland as a slave – nothing to celebrate so far. According to his Confession, he was told by God in a dream to flee from captivity to the coast, where he would board a ship and return to Britain. In 432, he again said that he was called back to Ireland, (Pay close attention), to Christianize the Irish from their native polytheism. Irish folklore tells that one of his teaching methods included using the shamrock to explain the Christian doctrine of the Trinity to the Irish people – hence the color green—(at first the Irish color was blue) Today, it is a celebration of bringing Christianity to Ireland. (And the drinking?) It also celebrates the end of lent and the brewing of great lager. This blob sounds a little to whiny for my taste, so for the short time we have left, let’s change view. 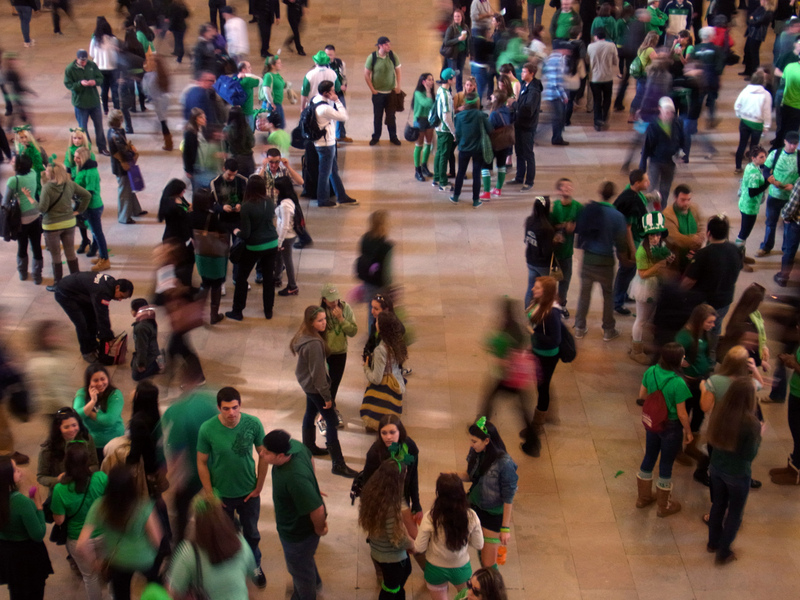 What I love about St Paddy’s Day, is that there is one day a year when everyone wants to be Irish – or at least dress in green. People of all colors, shapes and sizes, find something in common to celebrate. And whether it is the act of getting drunk or going to church, everyone really seems to like everyone else. (Except women with baby carriages who use them as a weapon to negotiate their way thru crowds). Everyone finds something attractive and friendly about being one thing. In this case it’s Irish, but wouldn’t it be lovely to find many days for everyone to like the same thing. And, by the way, Danny Boy was just a set of unsuccessful lyrics until finally sung to the tune of Londonderry Air – that most newcomers from Ireland have never heard. Why does one song make so many people cry? I hit Penn Stn about 11am. The Metro North concourse had about 30 square feet of empty space. I was going to shoot some pics from the escalator but they were shut off and I wasn't stopping. Did get off a couple just shooting backwards overhead. I asked the cops if it was worse on New Years. "No. It's cold on New Years. People go home."